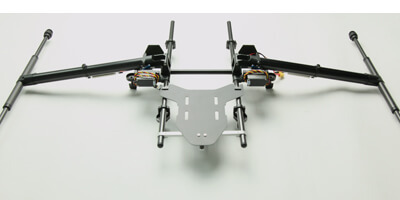 DJI releases "S800 Retractable Landing Gear"
The retractable landing gear, another innovative Unmanned Aerial Vehicle feature from DJI, is designed for the S800 Hex copter to improve perspective for aerial-filming and photography work. By using a 2-position switch channel of the radio controlled transmitter, you can control the landing gear remotely and without it obstructing the camera lens, allows users to film seamlessly through 360°. New firmware for the Zenmuse Z15, Zenmuse Z15 IMU firmware version 1.0.18_beta, GCU 0.0.10, Assistant Software version 1.4 and Manual version 1.9 have been released. The gimbal no longer bounces when attached to the working mode switch. The roll axis no longer drifts after the calibration of the gimbal. The S-Bus and PPM Receiver are supported (S-Bus -> AUX2，PPM ->AUX3). The gimbal attitude information (PAN/ TILT/ ROLL) is available for display on screen, when using the DJI iOSD.